This model analyzes 31P-NMR spectroscopy data from human skeletal muscle as work rates vary from rest to maximal exercise. 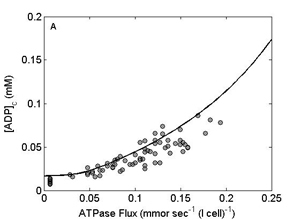 It generates reasonable predictions for observed ADP and inorganic phosphate (Pi) concentrations in cytoplasm, which verifies the hypothesis that oxidative ATP synthesis is primarily controlled by substrate (ADP and Pi) levels in skeletal muscle. 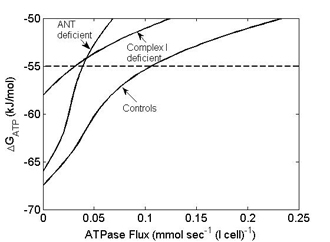 The figure to the left shows model-generated curves of free energy of ATP hydrolysis against ATP hydrolysis rate for the healthy subjects, the complex I deficient subjects, and the ANT deficient subjects. 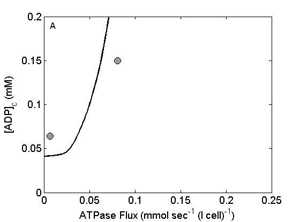 The free energy of ATP hydrolysis DGATP, is computed based on model-predicted concentrations of metabolites in cytoplasm. 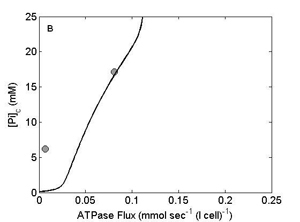 The dashed line corresponds to a DGATP value of -55 kJ/mole. 1. 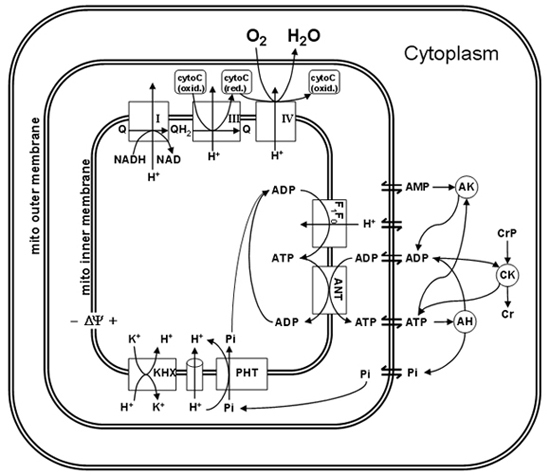 Beard, D.A., A Biophysical Model of the Mitochondrial Respiratory System and Oxidative Phosphorylation. 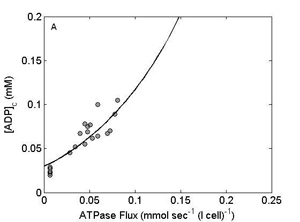 PLoS Comput Biol, 2005. 1(4): p. e36. 2. Jeneson, J. 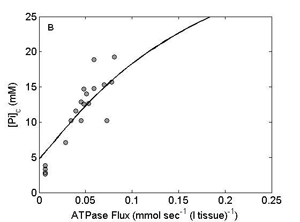 A. L. et al., Quasi-linear relationship between Gibbs free energy of ATP hydrolysis and power output in human forearm muscle. Am J Physiol, 1995. 268(6 Pt 1): p. C1474-84. 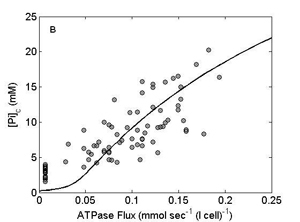 Wu F, Jeroen AL Jeneson, Beard DA, Oxidative ATP Synthesis in Skeletal Muscle is Controlled by Substrate Feedback, American Journal of Physiology – Cell Physiology, 292(1):C115-24, 2007.